These days, I'm obliged to live very quietly, in order to function at all. No excitement whatsoever, lest I start to have fun, whereby my head would most probably explode into a thousand teeny pieces. Tired of trying to explain to the Resident Eggheads that I get Zippy the Pinhead Syndrome whenever anyone shrieks, or barks, or if the telly goes up to eleven, (I even tried crying, to no avail, teenagers seem hardwired to not notice), I have retreated to my bedroom, with the door closed. Handsewing. When my eyes are up for it. Otherwise, sleeping. On the rare occaisions that I leave the house, I wear extra-dark glasses, because I am a vampire and the sun burns my eyes, and because I want people to look at me twice and wonder if I'm a rock star travelling incognito. 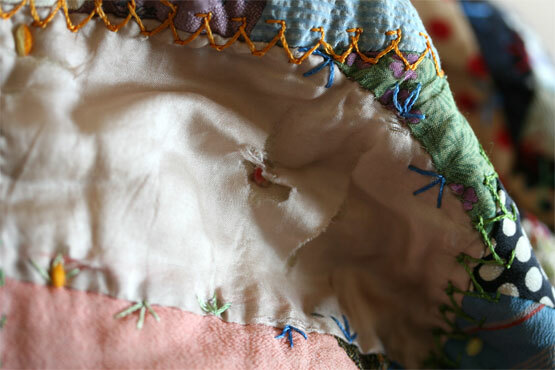 My antique crazy patchwork quilt, handstitched in silk during the Victorian era, which managed to happily survive the last 100 years, has been all but shredded from living on my bed and being jumped on by kids and dogs in the last five. It's a mess. Or I've started to, anyway. Starting with a patch from the stash; an embroidered potholder from the 1920s that was never completed, that I found God knows where, and which I've souped up a little. I notice, for the first time, that more than one person made this quilt, there is such variance in the stitching. 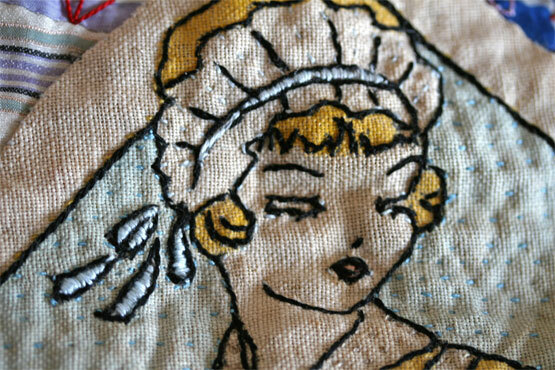 And I wonder what these women dreamed of while they sewed. Were they happy, hopeful, heartbroken? In their wildest dreams, could they possibly imagine that I would be sitting here,100 years later and on the other side of the world, working on the same quilt? I ponder on like this for hours, as the first patch nears completion. Only a hundred and eleventy to go. 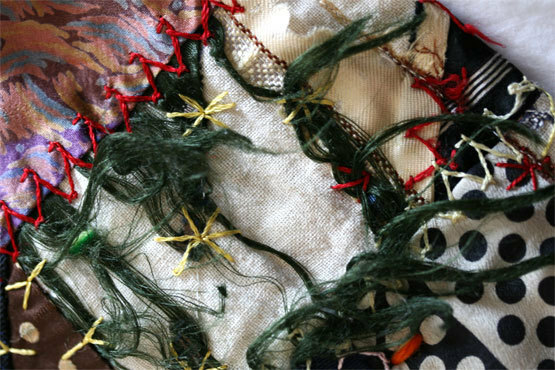 I'd forgotten how magical and restorative hand stitching is. The light in my bedroom is perfect. Tomorrow, the endocrinologist. I hope he has something inspiring to say.